Writing a ‘blog’ is a bit of a strange experience as you don’t know who your readers are. Some of you are visiting my website for the first time looking for holiday cottages, whilst others are guests and friends having a quick browse to see what’s happening in Loweswater. I hope you all find something of interest. For those I know personally, the big family news at the moment is that my son, Paul, and his wife Ann, had a baby daughter, Ella Georgina, on 1st September. She is gorgeous, very small and neat and I thought you might like a photo of her having her first IT lesson! She’s still a bit young to go on the bike! Meanwhile, back at Foulsyke, the swallows and house martins are gathering on the telephone wires discussing their routes south and at the same time the geese are starting to appear over the lake, some in immaculate V formation, others, I think, are just learners. 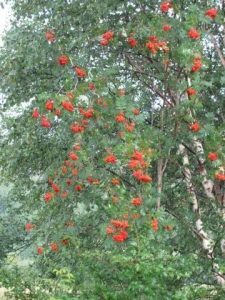 The rowans are covered with bright red berries and there are some in the wood behind that positively glow in the morning sun. It also seems to have been a good year for the red squirrels as we have several young scampering across the lawns and finding their way round the feeding boxes. My sister, Margaret, always come to stay around her birthday and we have a birthday walk. 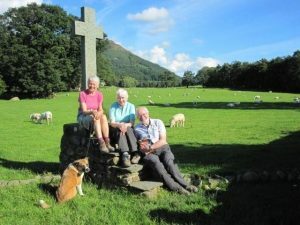 This year’s walk was a bit extended as we decided to do St Bega’s Way, a short long distance walk from St Bee’s to St Bega’s Church at Bassenthwaite. We were joined by Lesley, an old walking friend from Bristol. 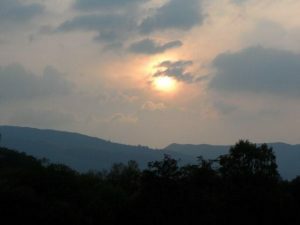 We had a good time: it was an excellent walk, very varied and at the end we felt as though we had travelled quite a distance. One of the high spots was going up to Black Sail, (much reminiscing about cleaning teeth in the stream), and then up Loft Beck to contour round Brandreth towards Honister Slate Mines. The sun shone at that point and we could see Foulsyke as a little white speck at the far end of Crummock – always pleasing! At the end of the week we were joined by friends for a posh picnic at the Lakes Alive event at Derwentwater. A French company, Ilotopie, gave this rather bizarre, very French performance, Fous de Bassin, with cars and beds and weird and wonderful creatures gliding over the surface of the water to the accompaniment of lots of music and fireworks – still don’t understand what it was all about but it was great fun on a beautiful summer’s evening…… and what a spectacular backdrop! I know many of you are interested in the Loweswater Show which this year was held on a gloriously sunny day: if you want to catch up on it visit Roger and Ann Hiley’s website – you can even hear the band play!